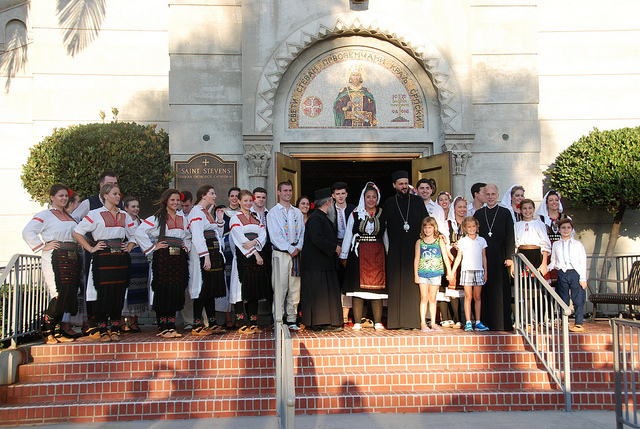 Alhambra, CA - On Satuday, August 31st of Diocesan Days 2013 - Freedom to Pursue the Faith, the day began with the Hierarchical Divine Liturgy concelebrated by His Grace, Bishop Maxim, Hieromonk Iakovos of St. Simonopetra Monastery on Mount Athos, Rev. Dr. John Erickson, St. Vladimir's Seminary Dean Emeritos, and all the clergy and parishioners of the Western Diocese. Following the Liturgy, refreshments were served and everyone gathered for the Symposium where our guest speaker Dr. James Skedros, Professor at Holy Cross Seminary in Boston gave a very enlightening presentation on "St. Constantine the Great". At the conclusion of the symposium a picnic lunch, prepared by the parishioners of the St. Sava parish in San Gabriel, was held in the pavilion with musical accompaniment all afternoon. A very special Stamatis Skliris Art Exhibit was open throughout the weekend, providing everyone an opportunity to purchase an original painting from this very beatuiful and colorful collection, "The Dynamic Earth", Stamatis Skliris' Vision of the Past, Present, and Future of American National Treasures. The Annual Diocesan Assembly was held later that day at 2pm and was followed by the St. Nikolai Velemirovic Oratorical Festival and a Folk Fest Program. The topic of the St. Nikolai Oritorical Festival was The Edict of Milan (313 - 2013). Three very talented and knowledgable finalists made their presenations with the hope of winning first place and going on to compete in the National competition at the National Annual Assembly to be held in 2014 in Alhambra, California at Saint Steven's Serbian Orthodox Cathedral. All of the presentations were outstanding and we congratulate our competators and thank them for all the hard work they put into this competition. Our First Place winner was Daniel Gligich from Fresno, California, Second Place winner was Oksana Germain from Southern California, and our Third Place winner was Christina Nourmiev from Seattle, Washington. Next on the program was a special pesentation to our youth by Hieromonk Iakovos from Mount Athos. Fr. Iakovos spoke to the children and teens about his life as a monastic and his experiences as a dentist at his monastery. Our youth posed questions afterwards about Fr. Iavokos' life as both a monastic and a dentist. The Folklore Program which followed, consisted of dance groups from parishes from throughout the Diocese who volunteered their time and talent to pariticipate in the 50th Anniversary of our Diocese. A special presentation was given by "Breze", a group of young girls from St. Sava Church in Pheonix who sang several beautiful songs in honor of this Jubilee Celebration. At the conclusion of the program the Kolo Dancers were led off the stage by Fr. Nikola Ceko, Dean of Saint Steven's Cathedral, to the Church where everyone gathered in prayer at the Great Vesper Service. Later that evening, at dusk and before the dinner was served, guests gathered outside on the field just behind the pavillion for two evening events. Dr. Michael Pravica, Associate Professor at the University of Nevada, made a brief presentation in Commemoration of Nikola Tesla and gave an electrifying demonstration of the Tesla Coil, allowing volunteers from the audience to participate. While enjoying this event guests were also invited to particiate in some Beer Tasting from Pure Order Brewing Company which will be opening in the fall of 2013 in Santa Barbara. After a very eventful evening everyone moved into the pavillion for dinner and an evening of music, dancing, and fellowship. We wish to thank our Emcee, Valarie Glover, our Oritorical Festival Coordinator and Director of Christian Education, V. Rev. Dr. Bratislav Krsic, and our Folk Fest Program Coordinator, Liljana Pantovic for their hard work and participation in organizing the Saturday afternoon Program and Youth Pesentation.